On June 5, 2005, the concluding day of a ten-day silent illumination retreat at the Dharma Drum Retreat Center (DDRC), Master Sheng Yen in his Dharma talk suggested that DDRC hold a retreat specifically for monastics, and send invitations to other monasteries, so that more monastics can experience what our retreats are like. Fourteen years later, causes and conditions ripened and his wishes finally became reality. Before this, DDRC had conducted monastic retreats, but only for members within the Sangha of Dharma Drum Mountain (DDM). But such a wonderful opportunity should be open to more people. Therefore, when planning the 2019 schedule, we decided to add this sixteen-day monastic retreat. When it was posted on DDRC’s website it immediately drew enthusiastic responses, three of which were from monasteries outside of DDM. What made this retreat special was, not only it was open to members of all monasteries, but also it was a formal retreat free of charge. The purpose was to allow more monastics to experience Master Sheng Yen’s Chan teachings. It was also an expedient means to spread Dharma. We received enthusiastic responses from not only monastics with the DDM Sangha, but also two monastics from Buddhist Insights, Ven. Suddhaso, and Ven. Soma (who was just ordained as a novice nun in December), as well as Ven. Phap Vu from the monastery founded by Master Thich Nhat Hanh. To support the retreat, we were grateful for bodhisattva Judy and eighty-plus years old bodhisattva Wei, who did all the cooking. Even though they were not in the best of their health during the retreat, they put in their best efforts, so much so that all retreatants could feel the positive energy in the foods they prepared. This retreat, from January 4 to January 20, was a silent illumination retreat divided into two eight-day sections. For the first section, we used video recordings of Master Sheng Yen’s Dharma talks given on a retreat held in Switzerland in 2004. The main topic of those Dharma talks was Hongzhi Zhengjue’s “Lancet of Seated Meditation.” For the second section we used video recordings of Master Sheng Yen’s Dharma talks from a retreat held at DDRC in November 2004. The main topic was “Silent Illumination Inscription,” also by Hongzhi Zhengjue. Ven. Suddhaso, the founder of Buddhist Insights, put all his heart into practice from the very start of the retreat. Young and gifted, he will surely become a major figure in the Buddhist community. As far as Ven. Soma, probably because she has only been a monastic for a short period of time, was struggling with her legs during sitting meditation. Nevertheless, she studied the method of silent illumination whole-heartedly. Of the nearly three hundred retreats I have supervised over the years, this one should be counted as one of the best. In North America, there is always a level of difficulty in conducting Chan retreats. This is because, between 1977 and 2006, all the retreats held by DDM in North America were led by Shifu (Master Sheng Yen). The retreatants had been accustomed to Shifu’s ability in holding their attention and stabilizing their minds. Once Shifu was no longer around, the retreatants could not get used to Dharma talks delivered from video recordings. During the three years I have worked at DDRC, video recordings were used for only two retreats. All other retreats were taught by DDRC faculty members. But from my experience of supervising nearly three hundred retreats in Taiwan using Shifu’s video recordings, I think the Dharma talks from Shifu’s videos still provide more clarity and comprehensiveness. 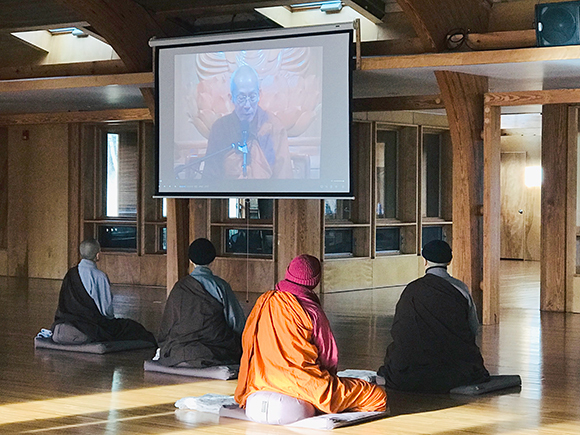 In this retreat, I was very moved by the retreatants’ concentration of mind and diligence of practice, and by having a chance to listen to Shifu’s Dharma talks again. But this retreat was so different, mainly because it was for monastics only. Its level of intensiveness was so distinct in every respect. Just to name a few: all retreatants arrived early at the Chan Hall at the beginning of every session. Short breaks took only five or six minutes before they all came back to their cushions. During sitting meditations, there was no noise from shifting legs or bodies. One could only hear the sound of air moving. The retreatants paid full attention when listening to Dharma talks. They worked very diligently during their work assignments. When they left the Chan Hall, the cushions and towels were arranged so neatly that it looked as if no one had ever sat there. When they walked in and out of the Chan Hall, their steps were quiet and serene. During the day, sunlight sprinkled through the windows and onto the retreatants. Their meditation postures were harmonized and fused into the quiescence of the Chan Hall. During walking meditation, the silhouettes of the retreatants inside and the silhouettes of deer outside seemed to have fused together and transformed the scene back to the Deer Park of the Buddha’s time. Unlike the summer monastic retreats in DDM Headquarters in Taiwan, where some monastics were assigned to participate, everyone in this retreat came voluntarily, and therefore, everyone especially cherished the opportunity to be able to participate. In Buddha’s time, the monsoon season in northern India ran from March to August every year. It rained so much that most of the areas were flooded. People had to move to higher ground. For safety reasons, the Sangha took retreats in areas that were not affected by flooding. That became the tradition of “summer retreat.” During such an intensive meditation retreat, the most enjoyable hours for the disciples must have been in the afternoons when Buddha gave his Dharma talks. Twenty six hundred years later, it seems that time and space has warped into DDRC in North America, where January and February are the coldest months of the year. The temperature sometimes goes as low as zero degrees Fahrenheit. Breathing in such a cold weather hurts one’s respiratory passageway. Snow from the day before becomes ice after the low temperature overnight, which makes it difficult to walk outdoors. Therefore, activities in DDRC are kept to a minimum. In contrast to summer retreats in India in Buddha’s time, at DDRC, winter retreats are the best time for monastics to practice. In the afternoon just before the end of the first section of the retreat, it was sunny outside. We took a walking meditation in the woods. The wind was blowing and the temperature was close to freezing. The ground was covered by leaves fallen from the trees. As we stepped on the leaves, we could hear the cracking sounds of the thin ice broken under our feet. We walked through the woods, past the narrow wooden bridge over the brook, and finally stopped by the lake. The wind blew up countless ripples on the water surface. As we stood by the lake and contemplated the scenery, our mind remained calm and still, and yet we could perceive even more clearly the impermanence and ever-changing nature of phenomena. At the end of the retreat, as we shared our experiences, the deep introspection from every retreatant made all of us realize how much we receive from all sentient beings. We should vow to arouse our Bodhi mind and transfer all merits to sentient beings.